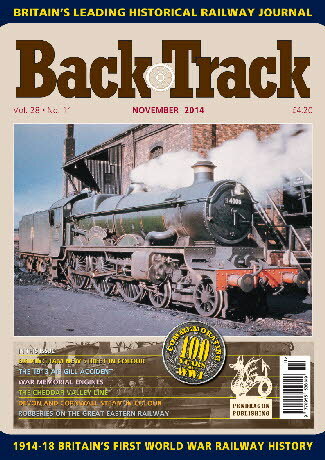 Railway Magazine | BackTrack November 2014 journal from Pendragon Publishing. Steaming through the Thames Valley - two colour pages of scenes around Hanwell and Sonning in the late 1950s by Ken Wightman. The Yatton to Witham Branch - Colin Maggs presents a brief history of the Cheddar Valley line. South Wales Locomotives - four pages of archive photos of motive power owned by the pre-grouping Welsh valley railways. The Rise and Fall of the Compressed Air railway - Adrian Gray tells the story of Arthur Parsey, a dubious 'inventor' of a revolutionary railway engine. Robberies on the Great Eastern Railway - Alistair F. Nisbet looks at a litany of Victorian crime. The Cream of Devon and Cornwall - four colour pages of country railway scenes in the early 1960s from the Roy Patterson collection. 100 Years On - The Ais Gill Accident revisited: Part One - Peter Robinson describes the notorious collision and fire on the Settle-Carlisle line in September 1913. Birmingham New Street - three colour pages by Michael Mensing of this important station before its controversial 1960s rebuild. The First Railway Guidebooks - J. D. Bennett reviews some early promotional publications from the 1830s. What did you do in the War, Mr. Porter? - A. J. Mullay considers railway employment, enlistment and casualties in World War I.
Robert Billinton: An underrated Engineer? - Jeremy Clarke reviews the career of a London, Brighton & South Coast Railway locomotive chief. London Transport Above Ground - three colour shots by Paul Joyce of tube trains on the 'surface'. War Memorial Engines - Sitwell D. Williams concludes our World War I coverage by looking at locomotives whose names commemorated people, places, battles and regiments associated with the conflict.